Don Brinkerhoff has come a long way since receiving his Bachelor of Science in Horticulture back in 1952. He and his wife Barbara are co-founders of Lifescapes International, which today is considered one of the leading landscape architectural firms in the world. The company has worked on over 1,000 projects around the globe, from master-planned communities and model home complexes to parks and golf courses to resorts and casinos, including eight of the leading hotels in Las Vegas and Belcourt in Newport Beach. ​Among Don's many contributions to his craft are introducing cobblestone-patterned concrete paving, developing a water weir system for lakes and streams commonly used today, and coining the terms "softscape" and "hardscape." Don has received many honors, among them being named a Fellow of the American Society of Landscape Architects, the industry's most prestigious commendation. Don and Barbara continue to run the company along with their daughter Julie Brinkerhoff-Jacobs, who is President of the firm. 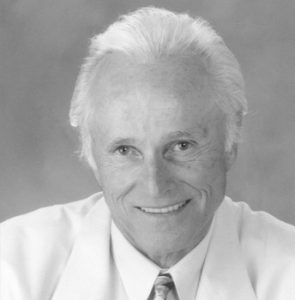 Don is the first architect to be inducted into the California Building Industry Hall of Fame.